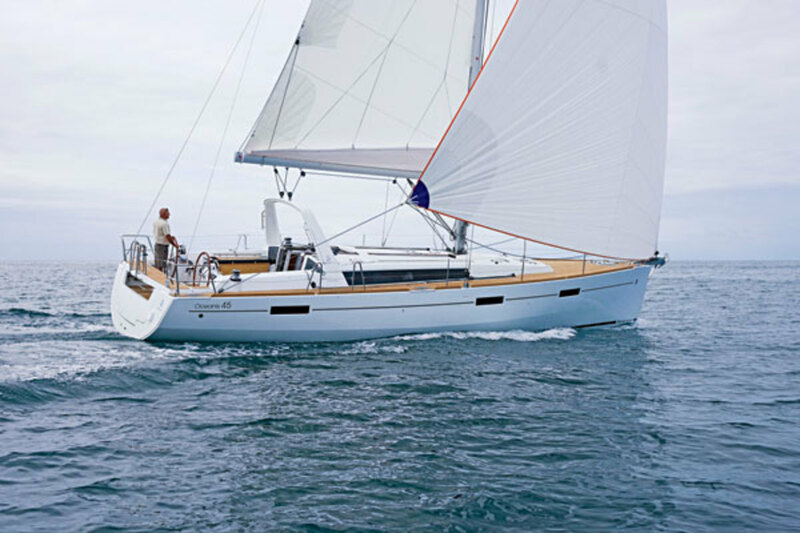 In addition to introducing and expanding its new Sense line of family cruisers over the past two years, Beneteau has also revitalized its ever-popular Oceanis line. In addition to introducing and expanding its new Sense line of family cruisers over the past two years, Beneteau has also revitalized its ever-popular Oceanis line. 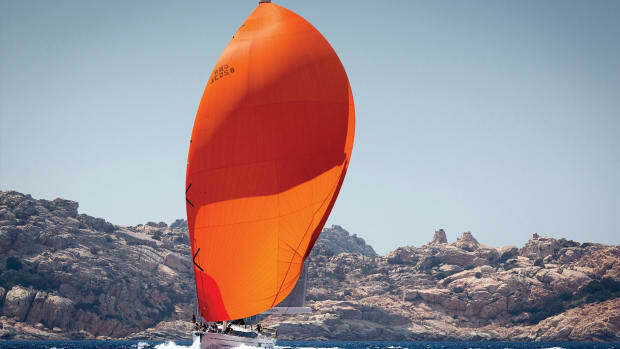 The new Oceanis 45 has been particularly successful, having snagged the prestigious European Sailboat of the Year award in the family cruiser category for 2012. Superficially, the Sense and new Oceanis design concepts seem quite similar, as both feature sleek, beamy hulls with hard chines above the waterline, mainsheet arches and low-profile coachroofs. In fact, the Oceanis concept is much more conventional, with accommodations running all the way aft and an interior that is deeper and more segregated from the cockpit. As such, the new Oceanis 45 should appeal to cruisers looking for a solid boat with modern styling and a traditional range of layout options. The hull is solid fiberglass set in polyster, while the deck, also fiberglass, is injection-molded and cored with end-grain balsa. The hull-deck joint is bonded with adhesive and fastened with screws. The hull is stiffened with a monolithic inner structural molding that is bonded in place. The keel, with cast-iron ballast, is bolted on with stainless steel fasteners and backing plates. The stock for the single spade rudder is fiberglass. The 9/10ths fractional rig features an aluminum mast with double spreaders and discontinuous stainless steel standing rigging. The deck and cockpit layout is clean and functional. 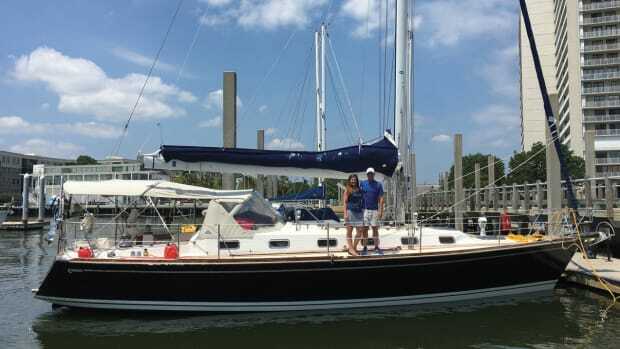 All hatches forward of the companionway are flush with the deck, in the contemporary style. All working lines run aft, with the jibsheets coming to self-tailing winches on the cockpit coamings within easy reach of the twin helm stations aft. 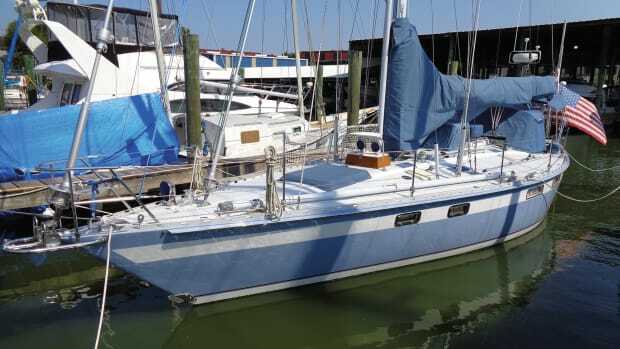 All other lines, including mainsail controls, come to a pair of winches on the coachroof either side of the companionway. The cockpit is very wide, but is bifurcated by a large fixed table with folding leaves, so crew can easily brace themselves to windward when the boat is heeled. This table has two insulated storage compartments, and our test boat had a multi-function nav display mounted in a module at its aft end, where it could be easily viewed from either helm station. Helm ergonomics are good, with clear sightlines forward and a mix of comfortable steering positions. A long bench seat directly abaft the wheels makes it easy for others to come aft and socialize with the helmsperson. The cockpit’s most impressive feature is the electrically controlled full-width fold-down transom. With just a touch of a button, the entire transom, including that bench seat behind the helms, folds down flat to form an immense teak-covered beach that sits nearly flush with the water. This will make it very easy for small pets and even infants to crawl on and off the boat from a tender. 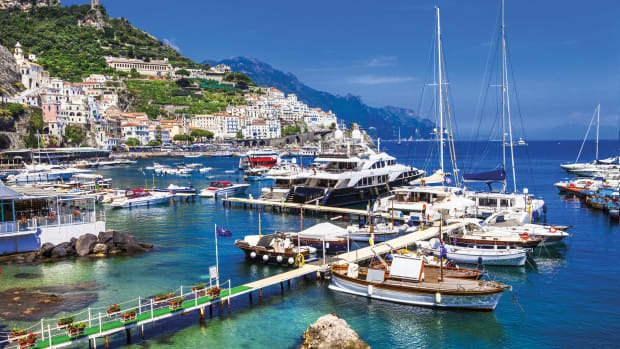 There are four interior layouts, ranging from two profligate charter configurations (four staterooms with two heads, or three staterooms with three heads) to two more moderate plans (three staterooms with two heads or two staterooms with two heads). Our test boat had the two-stateroom layout, which is definitely the one to pick if you value stowage space. In lieu of a second aft stateroom to port, this plan includes both a commodious pantry and an enormous storage room abaft the galley that can also be accessed from the cockpit. 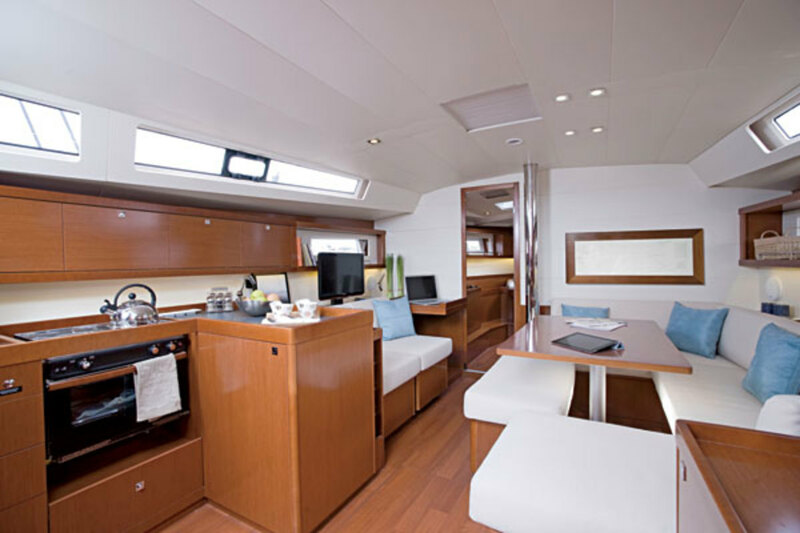 Both the moderate layouts have short settees to port, forward of the galley, which feature a clever sliding combination end-table/nav-table that can be positioned between or at either end of the two seats. 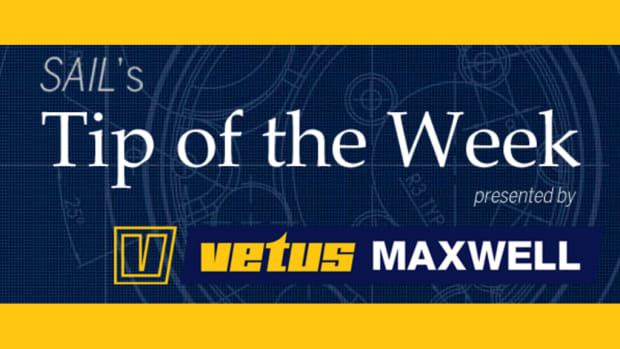 This is very versatile, but if you pine for a dedicated nav space, you will probably be disappointed with it. The charter layouts both have long in-line galleys to port with no nav space whatsoever. The aft staterooms are well conceived, with lots of light and headroom and proper double berths that don’t have bites taken out of them to accommodate the engine space. The forward stateroom, taking up a full third of the boat’s interior, is fabulous, with lots of private storage, a generous island double berth and a private ensuite head and shower.  I sailed the boat in very good conditions on Narragansett Bay. Our test boat had an in-mast furling mainsail and a 104 percent jib, and in 13-17 knots of apparent wind, we made 7 knots at an apparent wind angle of 35 degrees. Pinching to 30 degrees, we still managed 6.5 knots, and bearing away to 60 degrees we hit 7.7 knots. Turning off the wind onto a flat reach, our speed ranged from 5.7 to 7 knots in 8-12 knots of true wind. On a broad reach at a 140 degree angle in 8 knots of apparent wind, our speed was 5.3 knots. Helm response was generally precise with good feedback. While sailing close-hauled, the single rudder did lose its grip in one moderate gust, so we balanced the helm by increasing tension on the mainsail halyard. In stronger winds I expect you’ll need to reef early to keep the rudder working properly. This boat has a very wide stern and I suspect it would benefit from having twin rudders, like the boats in the Sense line. 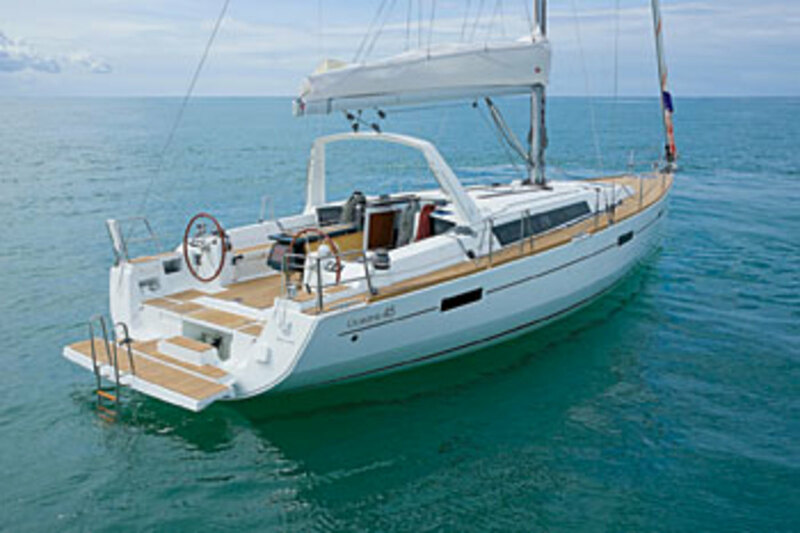 The Oceanis 45 is powered by a 54hp Yanmar diesel engine and can be ordered with Beneteau’s new Dock & Go drive system. This marries a rotating saildrive leg with a bow thruster and joystick control that makes it possible to drive the boat sideways (or in any other direction) with your fingertips. 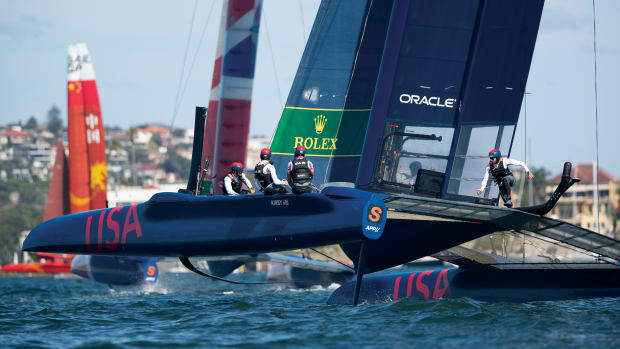 This is a pricey option (approximately $15,000), but will be valued by those who dislike maneuvering sailboats at close quarters under power. Driving our test boat in open water away from the docks in Newport, I found it performed well. We carried a speed of 7.2 knots running the engine at 2,150 rpm, and at full revs of 3,000 rpm we ran at a crisp 8.6 knots. 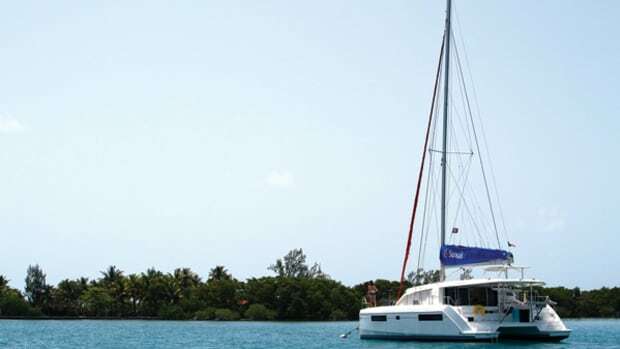 The Oceanis 45 is an attractive, well-conceived cruising boat that should appeal to sailors who like clean modern styling combined with more conventional accommodation plans. The large, practical fold-down transom will be particularly seductive to families who like to spend time in the water; it will also find favor with those who put a premium on easy tender access.